Every community should have a museum to display photos, documents, and artifacts that bring its past to life. Just over a year ago, Chowchilla’s Historical Society made the dream of a museum a reality. With the support of the Chowchilla Fair’s Board of Directors, a former storage building at the Chowchilla-Madera Fairgrounds was transformed into an interesting history display. 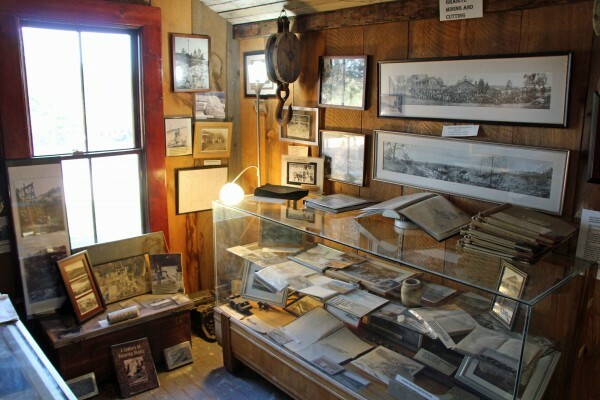 If you live in Chowchilla or the surrounding area, have a family connection to Chowchilla, or are interested in local history in general, you will probably find the museum’s exhibits interesting. Growing up with a great aunt and uncle who lived in Chowchilla, and many relatives (including my great-grandparents) buried in the cemetery, we usually visited at least a couple of times a year. Despite this, I knew relatively little about the town’s history until my recent visit to the museum. 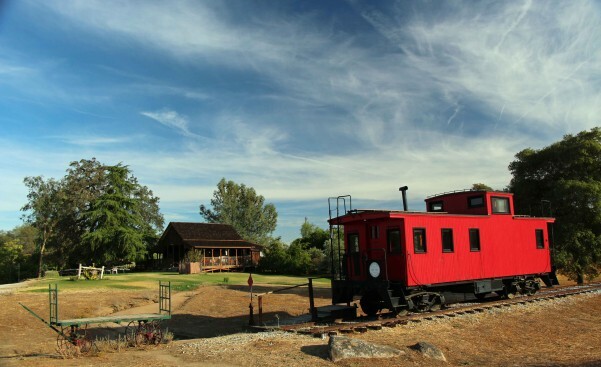 Most of the earliest towns in our valley were planned out by the Southern Pacific Railroad in the 1870s as it built southwards from the transcontinental railroad line at Lathrop. Some of these include Merced, Modesto, Fresno, Tulare and Bakersfield. A large number of later towns and surrounding farms were created and sold by land companies, many of which guaranteed irrigation water from local rivers for the purchasers of the land. Chowchilla and the nearby community of Dairyland were organized on this model, a system sometimes referred to as “colonies” elsewhere in the valley. I visited the museum for the first time in January during the second annual open house. Due to staffing limitations, the museum only has regular hours during the fair and (May 19-22, 2016) but appointments can be scheduled to tour the museum by contacting Chris Thomas, the museum curator, at (559) 665-1920. For more information about the fair, go to http://chowchillafair.org/. Chris and the other members of the historical society are friendly and extremely knowledgeable about the area’s history. I enjoyed my visit and learned a lot about the history of the Chowchilla – Dairyland area. School groups and other groups are always welcome for tours. The Chowchilla Historical Society continues to work on adding and improving exhibits and welcomes the participation of more members of the community. For membership information, contact Chris Thomas at the phone number listed above. To find the museum, exit Highway 99 at Robertson Boulevard and drive west. Turn left on 5th Street. After the road bends right, look for the fairgrounds on the left. Turn left by the lighted sign and drive into the fairgrounds. The museum will be on your left after you pass a large covered arena. Christmas is over and it’s still cold in the Central Valley. Once the holiday events have passed, the coldest months of the year often seem like a dead time for events and activities unless you’re going to mountains to ski or play in the snow. Despite that impression, there are actually a lot of great things to enjoy during this time of year within an hour’s drive or less. For the second year in a row, Fields of Ice in Turlock has brought ice skating to our part of the Central Valley. Located at 716 N. Daubenberger Road, this open air rink can be enjoyed during the day or under the stars as long as it isn’t raining. The rink will be open this season through January 19th. Ice skate rentals are included in the admission price and just about anyone can figure out how to propel themselves on the ice with a little practice – especially if you ever had any experience riding a pair of inline skates (rollerblades). It’s an especially fun activity with a group of family members or friends. Winter is a great time to enjoy live music or theater. 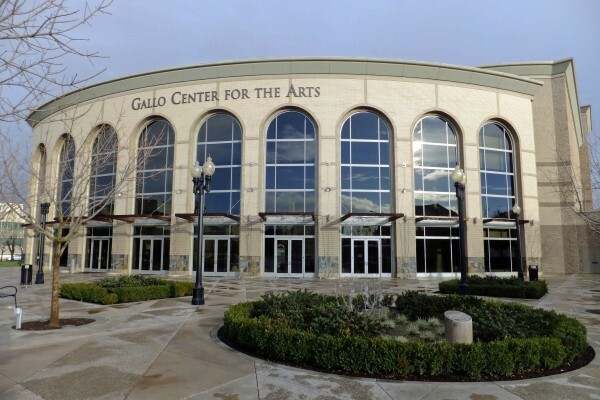 In addition to performing arts within our own county, the Modesto, Turlock, Fresno, and Sonora areas offer a huge range of live entertainment. For a list of performing arts venues and organizations within an hour’s drive, click here. 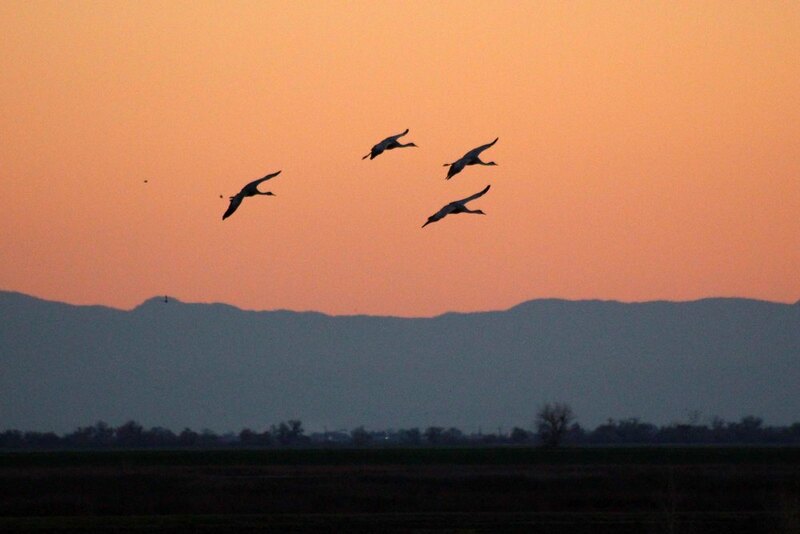 Before large numbers of humans settled in the Central Valley, much of the valley’s floor was a great wetland in the winter months – a permanent home for many species and a winter home for many more. 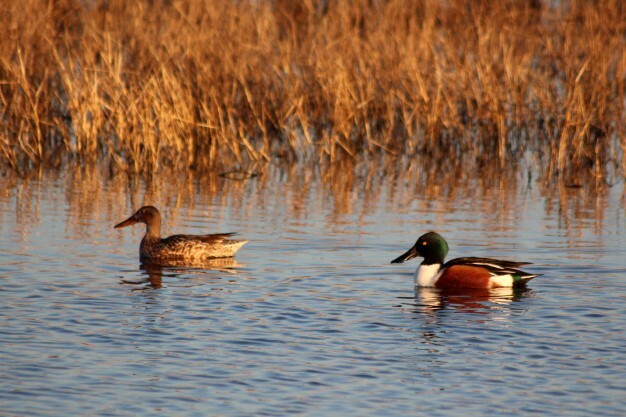 Large areas that are currently managed as wildlife refuges continue to provide both year-round and seasonal wetland habitat. 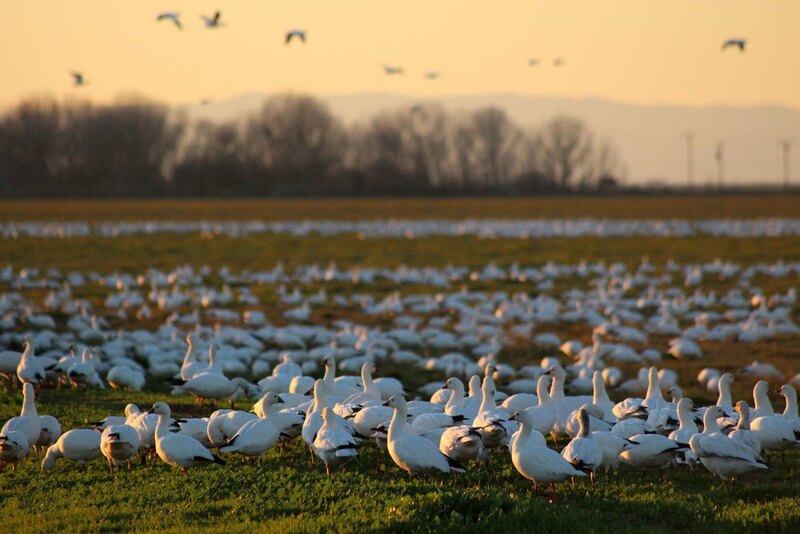 While the refuges are interesting throughout the year, they are especially enjoyable in the winter months when millions of migratory birds arrive. “Birdwatching… really??!? ?” I know that’s what some readers are thinking at this point. Visiting a wildlife refuge in the winter can actually be an unforgettable experience. If you’ve done it yourself, you know what I’m talking about. Don’t imagine this as sitting around for hours waiting for a single tiny starling or sparrow to show up. 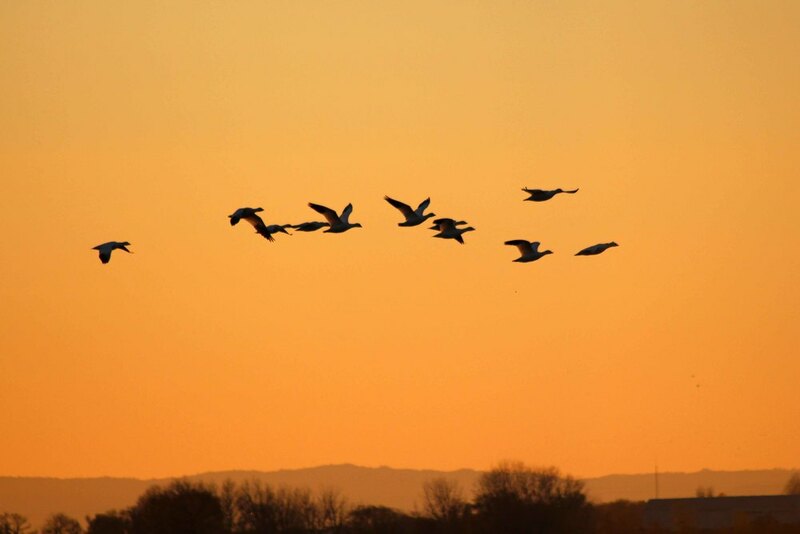 As you stand on a viewing platform in the crisp evening air and watch great flocks of ducks and geese silhouetted against an orange-red sunset sky, it seems like you’ve stepped into another world – even though you’re only a few miles from civilization. Evening is usually the best time to visit. 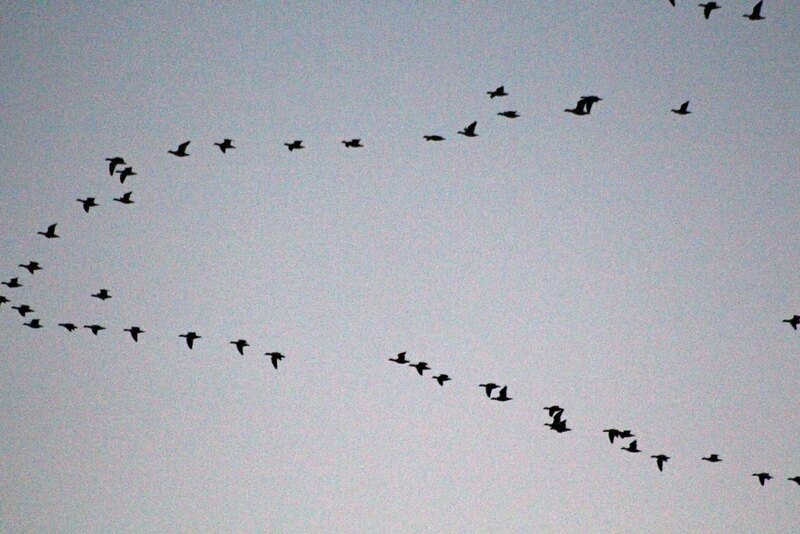 As the day ends, multitudes of ducks and geese return from feeding. 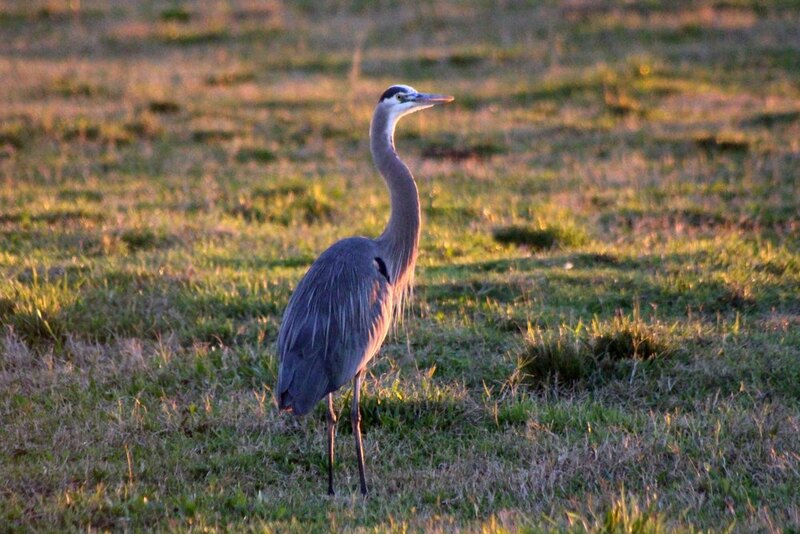 The refuges offer auto tour routes, short hiking trails, and viewing platforms to enjoy the avian show. The San Luis National Wildlife Refuge in Los Banos is also home to a large herd of magnificent tule elk. Although they aren’t always close to the fence of their large enclosure, I’ve been able to spot them every time I’ve visited and sometimes they’ve been very close to the viewing platform. No matter when you go, wear warm clothes and bring a camera and/or binoculars. 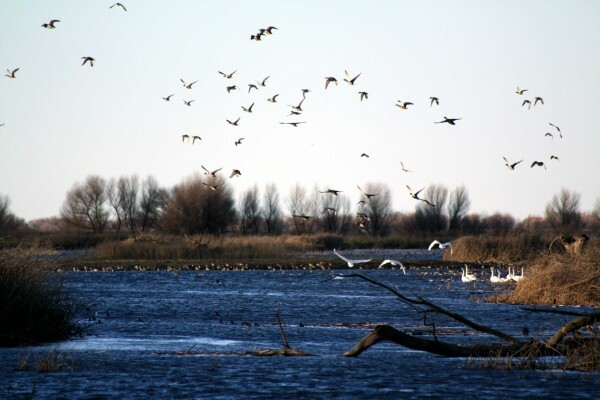 The closest refuge is the Merced National Wildlife Refuge, seven and a half miles west of Highway 59 on Sandy Mush Road. It offers a five mile auto tour route, three short trails, and viewing platforms. 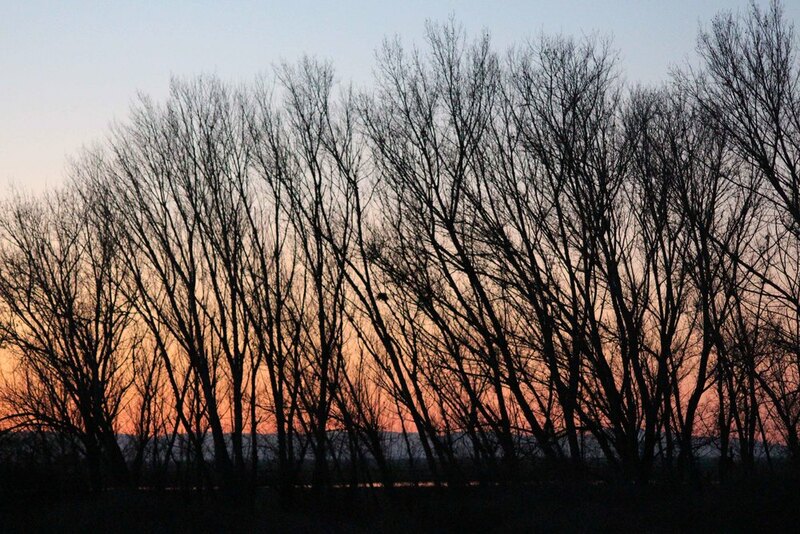 About seven miles north of Los Banos on Wolfsen Road, the San Luis NWR offers two auto tour routes, several short trails, viewing platforms, and a beautiful new visitor center with exhibits about local wildlife. If you arrive before evening, you can see both elk and birds in one day and also check out the visitor center (open 8AM to 4:30PM every day except federal holidays). 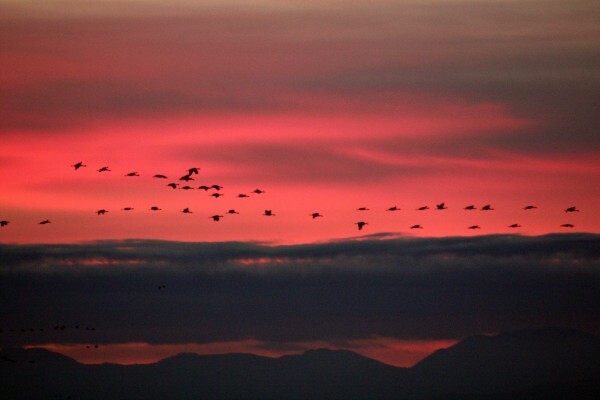 The refuges are open daily from one half hour before sunrise to one half hour after sunset. Admission to both refuges is completely free. Museums are great places avoid the cold in the winter and to cool off in the summer. 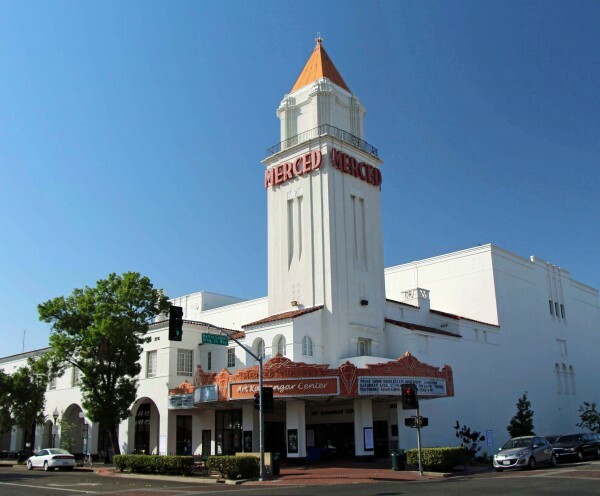 Merced County has a wealth of local museums, and so do the surrounding counties. The Merced County Historical Society’s exhibits in the beautifully restored 139 year-old courthouse at 21st and N Streets is a great place to start if you’ve never seen it before or if you haven’t been there in a long time. A new exhibit debuts every few months. For complete information about current events click here. The other rooms contain exhibits of the county’s history from the Yokuts people to the present time. Because museums often reduce their hours during the colder months, call to verify before you visit. Admission to many museums is free of charge, while others require a small per-person fee. 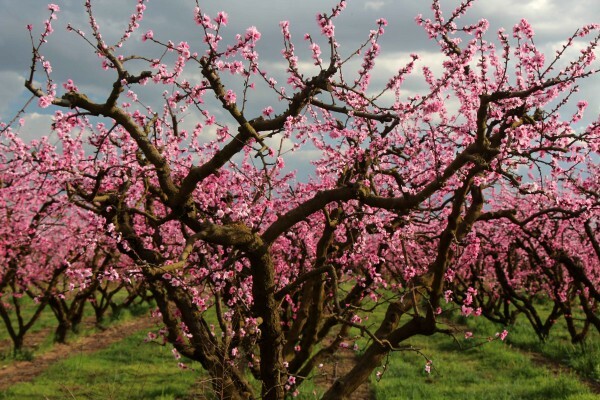 As winter draws to a close, local orchards put on one of the most impressive displays of blossoms that can be seen anywhere. 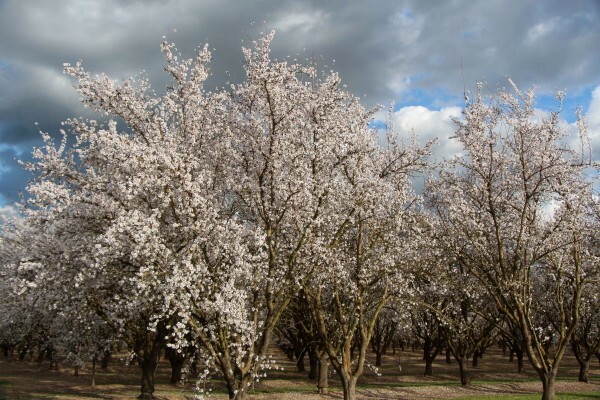 Usually beginning in the second half of February, these blossoms can usually be enjoyed by driving (or riding your bike) on rural roads in Merced County. For more info about blossom tours, click here. The University of California’s Cooperative Extension program has compiled several excellent tour routes for different parts of the county. The maps are available for free on their website: http://cemerced.ucanr.edu/Blossom_Tours_262/. It’s a great time to visit the Madera County Museum---unless it is very hot! Why now and not during the summer? Well, the museum has many things – including one of the best collections of history in the Central Valley – but the one thing it doesn’t have is air conditioning. In fact, it’s often closed in the summer because of the heat. I was blown away by the museum’s extensive collection and the successful way in which it brings to life the history of our valley. It’s a “new favorite” on my list of local places. Although not air conditioned, it is heated, so you can visit in comfort throughout the cooler months. If you plan to visit around the holidays, call and make sure the museum will be open. The museum holds special events throughout the year and is specially decorated for Christmas. 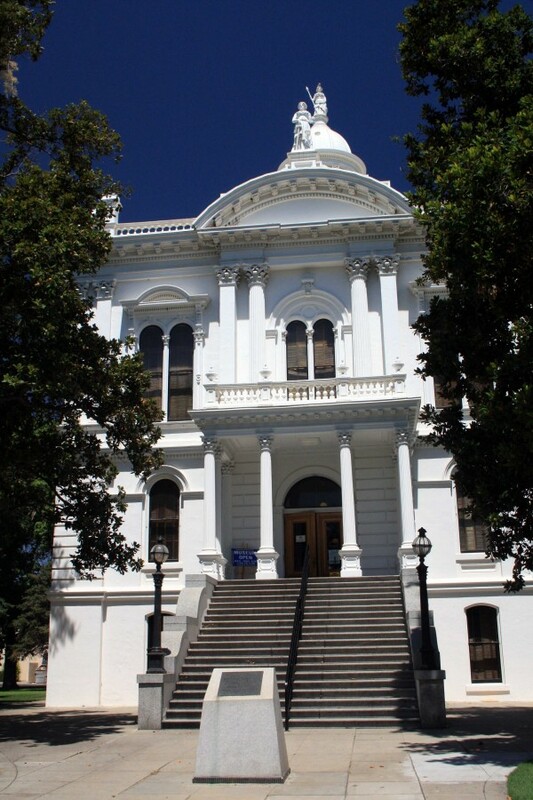 Like the Merced County Historical Society Museum, it is located in county’s old courthouse. You can find it at 210 W. Yosemite Avenue – only about 30 miles south of Merced. The main floor is divided up into rooms based on important themes in Madera County history. Although there are some differences between its history and Merced County’s history, there are also many similarities. The major exhibits include Native Americans, pioneers, agriculture and ranching, logging, early photography, a reproduction of a turn-of-the-century general store, and the involvement of Madera County citizens in America’s wars. Every possible display space has been used to showcase a truly amazing collection of artifacts – including many things I haven’t seen in any other museum. Some of my favorites include a full-size reproduction of a logging flume, an excellent collection of Native American basketry, an altar cloth from the temple in Madera’s Chinatown, and an example of a “duster” worn by stagecoach passengers to protect clothing from dusty roads. Several rooms on the second floor recreate a turn-of-the-century home. The original courtroom remains much as it was when the building was constructed. One of the largest rooms contains representations of Madera storefronts and window displays of the past century. 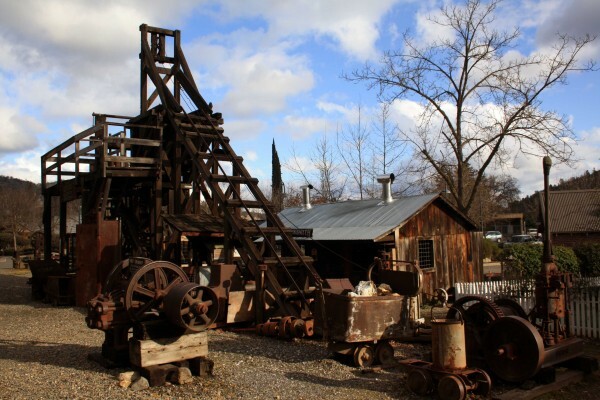 Once used on the road from Madera County to Yosemite National Park, is one of the highlights. By the time we’d seen the second floor, I was already more than impressed and ready to write a glowing review about it on this website. Then we headed down to the basement. The sign at the top had led me to expect a room or two of tools and machinery. Instead I found that the entire basement was also crammed with exhibits including a meticulously recreated blacksmith shop, a miner’s cabin and mining relics, a display about the granite quarry at Knowles, and an extensive collection of antique household and office technology. Throughout the museum history is brought to life by a well-chosen collection of historic photos. Allow at least an hour and a half… better yet, plan for two hours or more. We stayed until closing time and could have stayed longer. The museum is only open from 1 to 4PM on Saturdays and Sundays. For more information you can call (559) 673-0291. With people, it’s what’s on the inside that counts. The same is true for museums. Los Banos’ Milliken Museum may look like a 1960’s era elementary school building on the outside, but inside you’ll find a treasure trove of artifacts and history. Want to see evidence of some of the species that lived here in prehistoric times or artifacts from the Native Americans who first settled our valley? Want to know more about Henry Miller who led the development of the Westside’s agriculture and the town of Los Banos? Interested in seeing photos of destruction in Los Banos caused by the 1906 San Francisco Earthquake? Do you enjoy learning about the technology of home, business, farm, and community life in the past century? If you answered “yes” to any of the above, then you’ll probably enjoy a visit to the museum. Having not visited in several years, I stopped in a couple of months ago. The museum has recently reopened following a transfer of the building’s ownership and some necessary repairs that kept it closed through the winter. Local farmer, mail carrier, and historian Ralph Leroy Milliken started the museum’s collection in 1954 with documents, artifacts, and oral histories. He served as the museum’s curator until his death in 1970. In recognition of his pioneering effort, the museum has renamed for him. Today, enthusiastic volunteers staff the museum and carry on the tradition that he began. For those who want to learn more about local history, the museum sells several books written by Milliken and other local historians. Allow at least an hour to appreciate the museum’s collection. While you’re in Los Banos, don’t miss the statue of Henry Miller located at 6th and H Streets. You can then walk or drive around the area between H Street and Highway 152. This is Los Banos’ historic downtown and there are many interesting old buildings to see. If you’re hungry there are plenty of places to get a bite to eat including the legendary Wool Growers Basque Restaurant, a Westside institution for 120 years. The name comes from the work of sheepherding done by many of the early Basque settlers of the county. Hearty multi-course meals are served family-style in a dining room that has hardly changed in 50 years. It’s the perfect place to end a “history trip.” Just don’t forget to bring cash as it is the only form of payment accepted at Wool Growers. 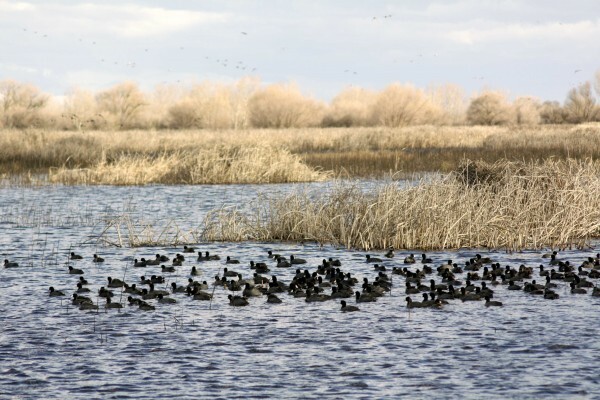 If you’re looking for something else to complete your trip, stop by the nearby San Luis National Wildlife Refuge to see tule elk and waterfowl. Near the refuge entrance you’ll see the Camp San Luis Adobe, the oldest intact building in Merced County. Built in 1848 by Francisco Perez Pacheco, the one-room house is now protected by a metal superstructure. 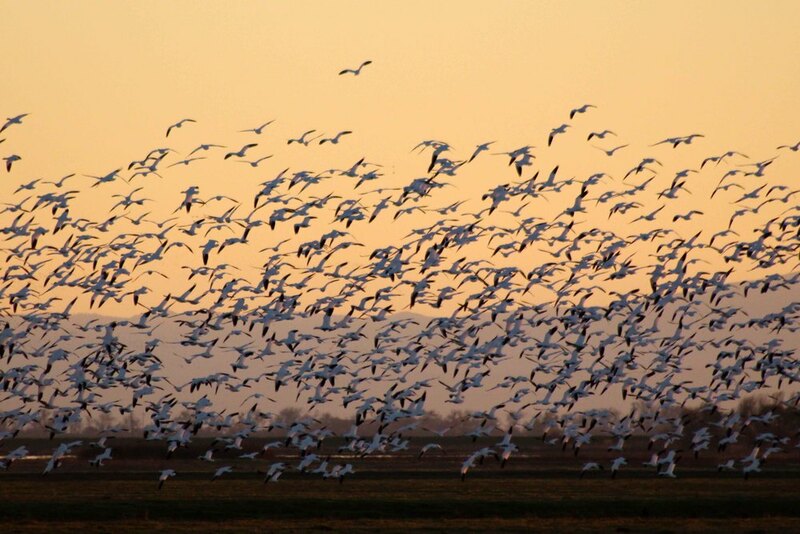 The refuge is located north of Los Banos on Wolfsen Road. 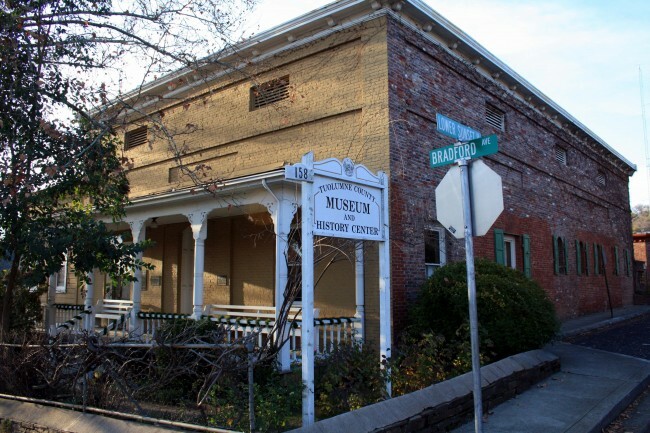 The Milliken Museum is located adjacent to Los Banos County Park along Highway 152 (Pacheco Boulevard) between 7th and 9th Streets in Los Banos. The park is also often known as “Pacheco County Park.” You can park in the parking area on Pacheco Boulevard or behind the museum on Washington Avenue. 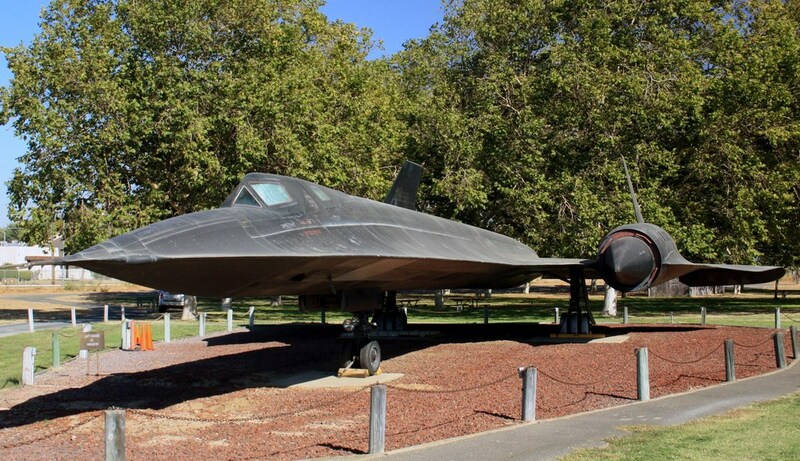 For more information, call the museum at (209) 826-5505 or go to http://www.ourlosbanos.com/millikenmuseum.html. The museum is open 1-4PM Tuesday through Sunday. Although part of Stanislaus County, Turlock is only 25 miles north of Merced – closer than some other towns that are within the county. Just like Merced, the core of Turlock was laid out by the Southern Pacific Railroad as it built southwards through the Central Valley in the early 1870’s. The town had a slow start, finally taking off after the Turlock Irrigation District built canals to provide Tuolumne River water for irrigation. Large tracts of land were bought up by land companies and subdivided as “colonies” – the “colonists” could buy the land on credit and pay off part of the loan after each year’s harvest. A pioneer wheat grower in that region asserted that the sand drifted against the stables in such high piles that pathways had to be shoveled before stock could be taken out. The board fences used in the early days often broke from the weight of the sand piled against them by the winds surging through the passes in the Coast Range mountains. Then came the grasshoppers. They were hatched in April, they appeared in full bib-and-tucker in May, they defoliated the vineyards and orchards in June, and only the bare peach pits, glistening like gnawed bones, were left on the trees in July. My great-grandfather settled in Turlock just 10 years after the time described in Smith’s history, so I grew curious about learning more. What drew him to Turlock? What were conditions like in 1914? The next time I drove up to Turlock I made a stop at the Turlock Historical Society’s museum. Located in a historic storefront at 108 S. Center Street, it is open Tuesdays and Thursdays from 11AM to 3PM. Admission is free and friendly volunteers are on hand to answer questions. The museum has an interesting collection of artifacts and antiques that illustrate the town’s development, life in the previous century, and the many peoples and cultures that came from around the world to settle in this area. In addition to what I learned from the displays, I am continuing to learn more as I read a local history that I bought while at the museum: Streams in a Thirsty Land – A History of the Turlock Region. If you make the trip up to Turlock, make sure you also plan to visit the Carnegie Arts Center at 250 North Broadway. Originally established as one of Andrew Carnegie’s philanthropic enterprises to spread education, the library was built in 1916. 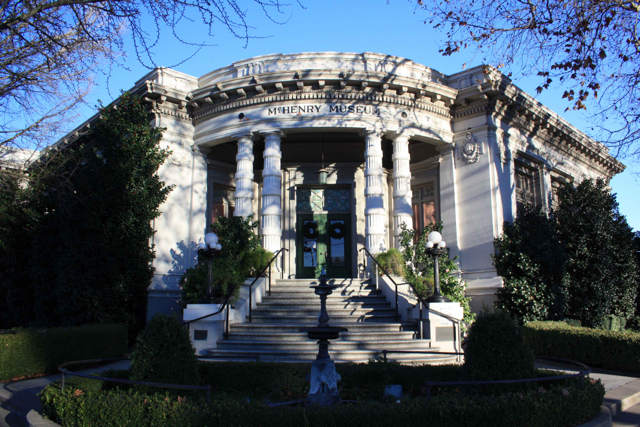 Nearly 150 Carnegie libraries were built in California during the early 1900’s. In 1968 the books were moved to a larger building and the former library was converted into a recreation and arts center. While being renovated and expanded in 2005 it was gutted by fire. 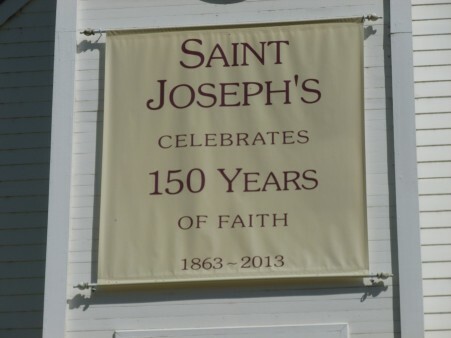 Overwhelming community support made possible the restoration of the building and the addition of an 18,000 square foot exhibit, classroom and office space. Regular art classes are offered for all ages, though the biggest attractions for visitors from outside the county are the frequently-changing world-class art exhibits. Admission is $5/person and the Arts Center is open Wednesday-Sunday from 10AM to 5PM. In 1806 a Spanish expedition into the Central Valley identified the Merced River as the most likely site for the first inland mission settlement. The recommendation was never acted upon because of the hostility of the valley’s Native American tribes. Although the original inhabitants of California had often been friendly to the Spanish during their first contacts, many tribes became more wary as disease spread, land was lost, and those who came to live at the missions were not allowed to leave. Many natives who fled the mission life ended up joining valley and foothill tribes beyond the active control of the Spanish.Although a number of land grants were made in the Valley after Mexico rebelled from Spain in 1821, there was never very much Spanish or Mexican settlement. In Merced County, the San Luis Gonzaga, Santa Rita, Orestimba, and Panoche grants were the only permanent settlement sites in the 1840’s. The closest town and closest mission of any size were located at San Juan Bautista, in modern San Benito County. 50 miles west of the current town of Los Banos, the mission was close enough to the valley that padres traveled along Los Banos Creek to recruit and/or capture natives to come to the mission. The annual “Path of the Padres” hike offered by California State Parks at Los Banos Creek Reservoir gives hikers a chance to retrace part of this route and to learn more about California’s early history. This hike is offered from February through April each year. Today, San Juan Bautista is one of the best-preserved remnants of Spanish and Mexican California. 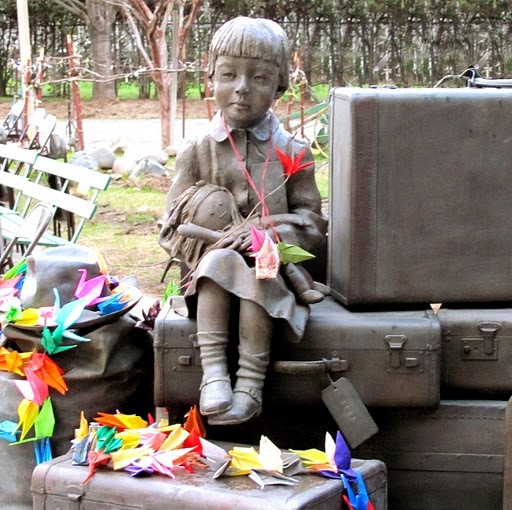 It is a town that time has nearly forgotten, with a current population of less than 2,000. Historic buildings dating from 1797 to the mid 1800’s surround three sides of the town’s plaza. The third side is open to the fertile San Juan Valley, with productive farmland stretching to the edge of the mountains. The only town center in California where all of the buildings date back to the mid-1800’s or before. The Plaza Hotel, Castro-Breen Adobe, Plaza Hall and Plaza Stable have been restored to the way they would have been then and are open to the public as part of San Juan Bautista State Historic Park. Closed on Mondays and holidays, they are open from 10AM to 4:30PM Tuesday-Sunday. There are few other places in California where it is so easy to imagine the 1840’s, when California was still a province of newly-independent Mexico. It’s a great place to learn about California’s history. For more information go to: http://www.parks.ca.gov/?page_id=563. The mission is still an active church but is open to the public from 9:30AM to 4:30PM seven days a week. Visitors can see exhibits about mission life and wander through the church and the garden. The church is one of the biggest and most impressive among California’s 21 missions. The thick adobe walls keep it surprisingly cool in the summer. A statue in front of the church commemorates St. John the Baptist, the church’s patron saint. For more information go to: http://www.oldmissionsjb.org/index.html. One block from the plaza is 3rd Street, the town’s main street. Lined by a collection of historic structures, including adobes dating back to the 1800’s, the street has many great restaurants and interesting shops. The historic core of the town is pedestrian friendly and quiet. You may see chickens wandering the streets or cats sleeping beneath the pews in the mission church. The cats are permanent residents of the mission and help to keep rodents from taking over. Despite its size, San Juan Bautista has a busy calendar of annual community events, celebrations, and festivals. These include annual arts and crafts festivals, car shows, art studio tours, food, music, and history events. For a regularly updated schedule of events, go to http://www.sanjuanbautistaca.com/. The state park offers a “living history day” on the first Saturday of each month with costumed docents and events for children. 50 miles west of Los Banos on Highway 156, San Juan Bautista is a great place for a day trip or an easy stop on the way to Monterey Bay. If you have a student in 4th grade who is studying California history, a trip to San Juan Bautista can bring it to life. Nearby Fremont Peak State Park offers a campground, an observatory, and a relatively easy but exciting ½ mile hike to a summit with 360 degree views of the coast, Monterey Bay, and the surrounding mountains, hills, and valleys. This is a place where history truly comes alive. Visitors have close-up views of the planes from paved, handicapped-accessible walkways. 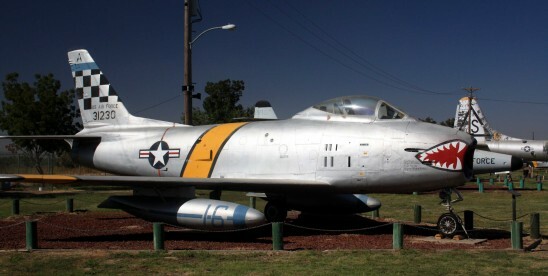 An indoor museum contains many additional Air Force and Army Air Corps artifacts and a B-52 simulator. The museum holds annual “open cockpit” days when visitors can view the insides of many of the aircraft. Group tours can be arranged. The museum has a gift shop, café, and RV park with full hookups. Outdoor aircraft display, indoor museum, café, gift shop, and RV park with full hookups. Group tours can be arranged and school groups are welcome. The museum has produced a teachers’ guide to the museum with classroom activities. The museum is open every day of the year except Easter, Thanksgiving, Christmas, and New Year’s Day. Summer Hours (May – October) are 9-5 and Winter Hours (November-April) are 10-4. Ranching has always been a big part of the economy and culture of central California. Started in the 1700’s when the Spanish drove the first cattle into the state, ranching continues today on thousands of ranches of throughout the state. Poorly suited for irrigation and constrained by the state’s limited water resources, California’s dry hills abound with native grasses and provide an ideal range for cattle. Because the state is dry so much of the year, ranches tend to be large with each head needing many acres to satisfy its grazing needs. Ranching life in California has generally followed the pattern of ranching life in other western states – with social gatherings centered around ranch work and competitions of skill – roundups, brandings, county fairs, and especially rodeos. 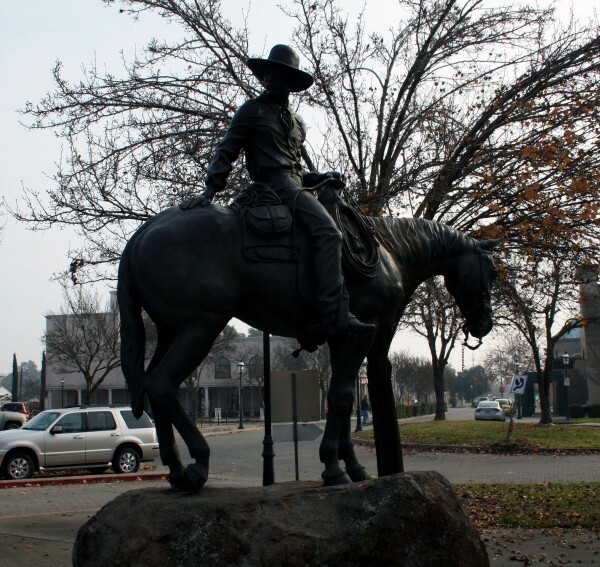 Starting in the 1950’s, Oakdale began to establish itself as “Cowboy Capital of the World.” The town has a rich western heritage including not only the big rodeos of the last 60 years, but also a ranching history dating back to the 1850’s. Much of this history is displayed and celebrated at the Oakdale Cowboy Museum. 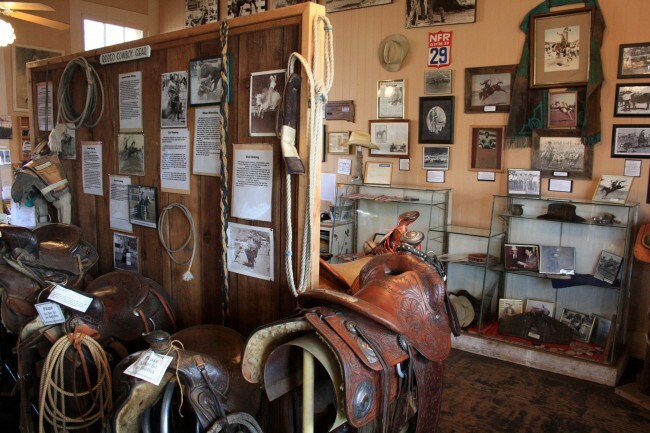 Located in downtown Oakdale’s old train station, the museum contains interesting collections of rodeo memorabilia, saddles, tack, ranching tools and implements, and historic photographs. Permanent exhibits feature local cowboys who won big in the arena and local ranchers whose operations have been handed down from generation to generation since the early days of the county. Although the museum isn’t especially large, there’s plenty to see and the volunteers on duty are helpful and knowledgeable. The first room contains permanent exhibits and a small gift shop. The museum has published a number of books of local history that are available for purchase. The second room contains both permanent and temporary exhibits. The current temporary exhibit features the tools and techniques of saddle-making. Other recent temporary exhibits have focused on the bronze cowboy sculptures of Jo Mora and the iconic stone fences and corrals of the local foothills. The Oakdale Rodeo on the second weekend of April each year and the museum sponsors several special events annually. Check the museum’s website or call for more information. The museum is open from 10AM to 2PM Monday through Saturday, except major holidays. If you are curious to learn more about the ranching and rodeo heritage of Central California, this is a great place to start. No matter what your level of knowledge and/or experience with western lore, you’ll learn something here. The cowboy statue in front of the museum is a popular backdrop for photos. About an hour’s drive from many towns in Merced County, Oakdale is an easy stop on the way to Sonora, Columbia, or Jamestown. The museum is located at 355 East F Street, in Oakdale, across from the historic H-B Saloon. Merced County’s history comes to life in the museum operated by the Merced County Historical Society. Housed in the 1875 Italianate-style courthouse, over 8,500 square feet of permanent and rotating exhibits tell of the history and development of the county. One of the oldest and best-preserved buildings in the region, the old courthouse was designed by the state capitol architect Albert A. Bennett. It is now on the National Register of Historic Places. The museum is open Wednesday through Sunday from 1-4. Admission is free and knowledgeable docents are available to provide tours. The building is wheelchair accessible. The gift shop sells a wide variety of books about local history, along with gifts and souvenirs. 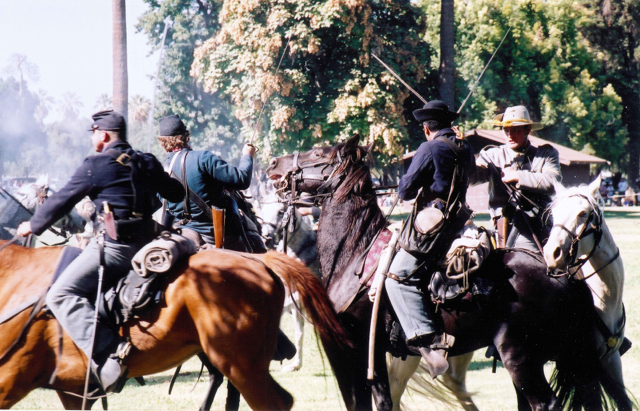 The Merced County Historical Society hosts a wide range of history-themed events throughout the year. Check the website for a current schedule. The museum holds a large collection of county records. Appointments to access the collection can be made by contacting the museum’s office. On the corner of M Street and West North Bear Creek Drive in Merced stands the Hooper House Bear Creek Inn (http://www.hooperhouse.com/index.html). This large colonial style home was constructed in 1936 to replace the Huffman Mansion, which burned in 1933. Merced’s Huffman Mansion was a near twin of Modesto’s McHenry Mansion. The homes were built by brothers-in-law Charles Huffman and Robert McHenry in 1883. Both men prospered from the development of the Central Valley and its irrigation systems. Charles Huffman acquired land for the Southern Pacific Railroad’s route through the Central Valley and selected the townsite of Merced. Huffman and McHenry’s 10,000 square foot mansions were the largest and most extravagant homes in the area. Although Huffman’s house burned, McHenry’s house was saved from demolition by the Gallo Foundation and donated to the City of Modesto in the 1970’s. It was completely restored and was opened to the public in 1983. It remained open until December of 2011 when it was nearly lost in a fire. A vigilant neighbor and Modesto’s firefighters saved it from total destruction. Over the past year a second meticulous restoration has removed the signs of damage – much of which was caused by the house’s fire sprinklers. Furniture and art have been cleaned and restored. Wallpaper has been replaced with detailed reproductions of the original patterns. The mansion is open for tours while the final repairs are being made. When I visited in December, one of the few things remaining was the replacement of the carpeting. The floor coverings are currently being reproduced by the British factory that made the original ones purchased by Robert McHenry. The McHenry Mansion is the best-preserved and largest Victorian mansion in Central California that is open to the public (outside of the Bay Area). Admission is free and you can join a tour Sunday through Friday between 12:30 and 4PM. Tours last at least an hour and are led by docents who are experts about the time period recreated in the mansion (1883-1906). On our recent tour I learned several new things about life and technology in the Victorian Era, despite having previously toured a number of other homes from the same time period. I was impressed by the success of the restoration. The interior of the house is close to sparkling like it did on the day it was completed. When the carpet is installed (planned for spring 2013) the effect will be complete. The mansion is located at the corner of 15th and I Streets in Modesto. Tours start at the Visitor Center and Gift Store – two doors down from the mansion at 924 15th Street. A ten-minute video shown prior to tours does a great job of introducing the time period and telling the story of the McHenry family. It is illustrated with an extensive collection of historic images. If you’re looking for unique gifts or special Christmas ornaments, the Gift Store has a nice selection. All proceeds go to the McHenry Mansion Foundation and its work to maintain this special house. To learn more about the mansion, the McHenry family and the early years of Modesto, pick up a copy of Colleen Stanley Bare’s The McHenry Mansion: Modesto’s Heritage. Bare has also written an excellent book about the Huffman family of Merced and their mansion: Pioneer Genius: Charles Henry Huffman. For more information go to www.mchenrymansion.org/mansion or call (209) 652-7190. The mansion is decorated for Christmas every year and the garden may be rented for parties, receptions, and weddings. Located nearby at 1402 I Street is the McHenry Museum. 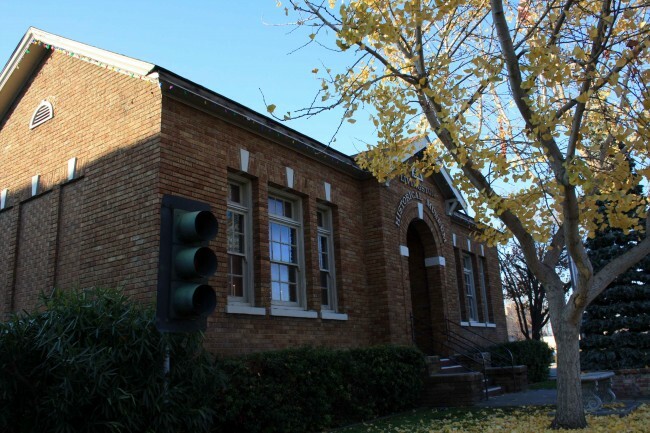 A vast collection of Stanislaus County historical exhibits and photographs are housed in a former library building that was built for the City of Modesto by the McHenry family in 1912. The museum is open Tuesday through Sunday from 12 to 4PM. Due to the size of the museum’s collection and the length of the tours offered at the McHenry Museum, it is difficult to visit both the mansion and the museum on the same day. It is best to plan two separate trips. From 1886 until the completion of the Yosemite Valley Railroad in 1907, the closest you could get to Yosemite by rail was the town of Raymond in the foothills of Madera County. Far more comfortable than stagecoach, many visitors chose to take the train to Raymond in order to shorten their stagecoach ride. When President Teddy Roosevelt visited the park in 1905 to meet and camp with conservationist John Muir, this is the way he traveled. Although the tracks are gone and most people have never heard of Raymond, the town still survives in the hills between Eastman and Hensley Lakes. Since 2008, it has boasted a great museum. The museum is located in the town’s first building – the Charles Miller House – built in 1886. What’s interesting about it is that it contains both the history of the town and a lot of information and photos of early travel to Yosemite. The house is furnished to look the way it would have looked in the 1880’s – furnishings interspersed with extensive displays of historic photos and artifacts. 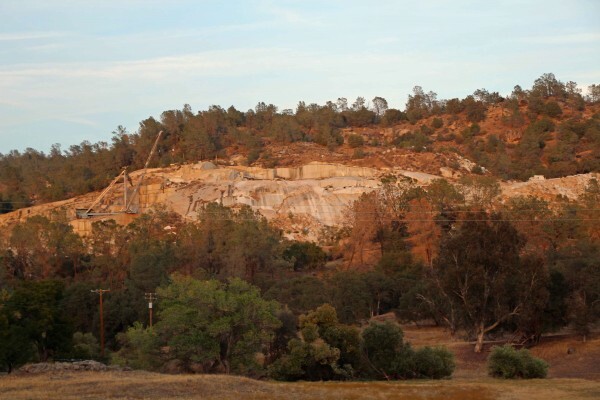 The nearby quarry at Knowles has provided “Sierra White” granite for many of the state’s greatest public buildings including the Los Angeles City Hall, the Campanile at UC Berkeley, and many of the civic buildings constructed in San Francisco after the 1906 earthquake. The museum has a room devoted to Knowles and its quarry. Outside is a huge granite saw – the oldest in California. If you have kids, they will enjoy the fully-restored Southern Pacific caboose in front of the museum. The interior is exactly the way it would have been when it was operational. It was recently brought back to this condition by dedicated local volunteers. In addition to the Charles Miller House and the caboose, there’s a fully-restored carriage house with a wagon, a buggy, harnesses, tack, ranch equipment, and historic photos. To find Raymond, head south from Merced on Highway 99 and exit at Robertson Boulevard in Chowchilla. Drive east over the freeway and follow signs to Raymond: East on Road 26, South (right) on Road 29, East (left) on Road 603, Left (north) on Road 600. When you arrive in Raymond, the museum will be on your right. Look for the red caboose and you won’t miss it. The address is 31956 Road 600 (also known as Raymond Road) – slightly less than an hour’s drive from Merced. It is open Sundays from noon to 4PM and by appointment. School and homeschool groups are welcome and there are tables where you can enjoy a picnic or sandwiches from the town’s general store. The Frontier Inn also offers food. A good museum or historic site only has the opportunity to become a great one when there’s someone who knows all about it and has a passion to explain it to everyone who comes to visit. Raymond area cattle ranchers Lynn and Wayne Northrop have poured thousands of hours into making this museum a fun place to learn about history and I really enjoyed meeting Lynn on my recent visit. She knows just about everything there is to know about Raymond, its history, and its many connections with Yosemite and her enthusiasm about it is contagious. 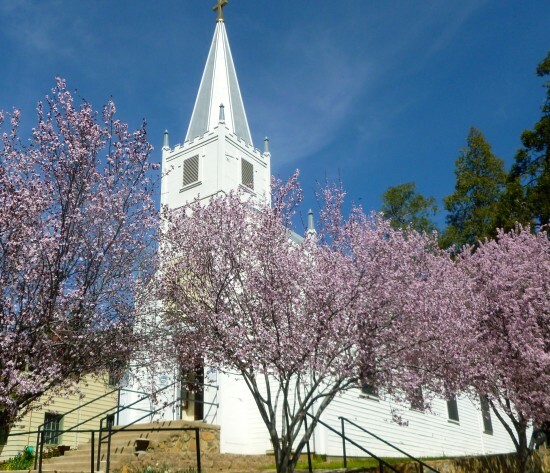 Although hot in summer, Raymond is an enjoyable place to visit in the fall, winter, or spring – especially during wildflower season (late March through May). Raymond’s general store/bar has the unofficial status of a living museum. It hasn’t changed much since it opened in 1914. The left side of the building is occupied by the bar, while the right side is occupied by the store. The store offers sandwiches, and the Frontier Inn Tavern on Front Street (visible from the main road) also offers food. Another place you can enjoy a good meal and historic photos at the same time is the Hills Pride Inn in nearby Knowles. To visit Knowles, continue through Raymond on Road 600 and turn right on Road 415. Turn right again on Knolwes Road (Road 606). After you pass the Hills Pride Inn on the right, look for the quarry on the left and the granite St. Anne’s Chapel on the right. This beautiful structure was originally built as the Knowles School in 1920, abandoned in 1942, and restored as a church in 1961-1962. 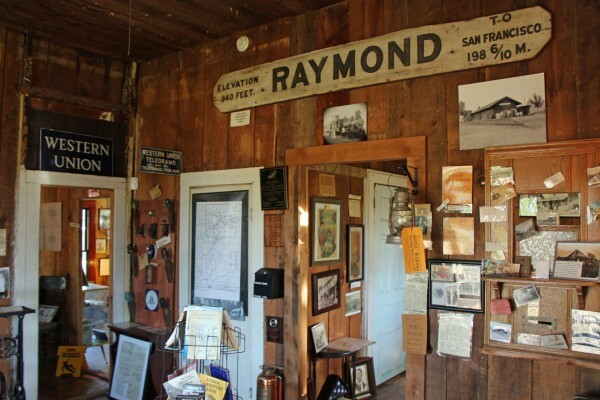 If you find Raymond’s transportation history interesting, you can find one of the stagecoaches that ran the Raymond to Yosemite route in the Madera County Museum. or by calling (559) 689-1886. 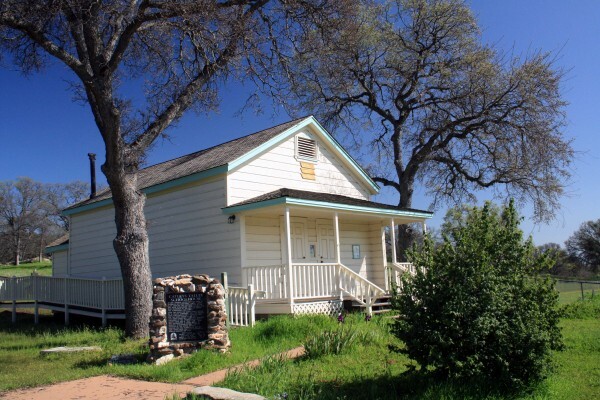 Most nearby counties – Mariposa, Stanislaus, Tuolumne, San Benito, Madera – and our own, have museums of county history. Surprisingly, Fresno County doesn’t. The Fresno Historical Society has a long-term goal of developing one at Kearney Park, but it may not happen for many years to come. That said, Fresno does have two meticulously preserved and restored mansions – the Meux Home and the Kearney Mansion. The city of Fresno was laid out by the Central Pacific Railroad in 1872, but not incorporated until 1885. The Meux Home was built in 1888-89, just after the incorporation. At that point the town had about 10,000 residents. The Meux Home is one of the oldest surviving structures in the town. Built for Dr. Meux and his wife Molly, it was occupied by the Meux family from 1889 to 1970. Dr. Meux was a surgeon in the Confederate Army from 1861 to 1865. The Meux family moved to California in 1887 because of Molly’s poor health. Although Molly continued to suffer poor health and eventually became both deaf and blind, the climate of Fresno was an improvement for her and she survived until 1922. Her daughter Anne lived in the house until her death in 1970. Anne’s occupation of the home insured its preservation with few changes. After her death, the house sat vacant for a couple of years but was eventually restored to its original splendor. Visitors can enjoy that splendor on docent-led tours offered on Fridays, Saturdays, and Sundays from noon to 3:30PM. Tours are conducted by well-informed docents in period costume. Visitors learn about the Meux family, the Victorian era, and the early history of Fresno. Admission is $5 for adults, $4 for teens 13-17, $3 for children 5-12, and free for children under 5. The home is also available for rent for weddings and other special occasions. 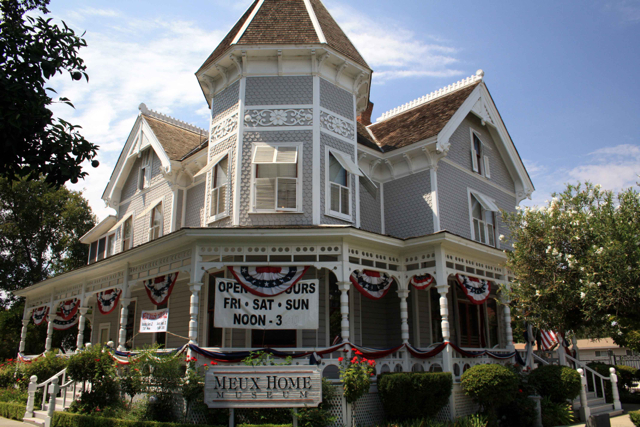 The Meux Home Museum offers a number of special events and displays throughout the year. Tours include ten ornate rooms on both the first and second floors. Special exhibits and displays change seasonally. The first floor is accessible to all visitors regardless of mobility via a wheelchair lift. The Meux Home is located at 1007 R Street in Fresno (corner of R and Tulare), between the 99 and 41 freeways. For more information, go to http://www.meux.mus.ca.us/index.html or call (559) 233-2331. Free parking is located next to the Meux Home. I really enjoyed my tour of the Meux Home. I’d always had trouble picturing Fresno’s Victorian period, but the house brought it to life for me. One of the biggest surprises was that the home was considered a middle class residence in the time it was built. Today its ornateness and size make it seem like a home built for a family further up the economic scale. Visiting historic sites like the Meux Home is a great way to learn about the past. Sometimes these places challenge our expectations and assumptions about other ages. While in the area, there are a number of other historic landmarks to see. Although many of Fresno’s oldest homes have been lost to time and progress, there are a number of interesting structures in the vicinity. For historic driving and walking tours, go to http://historicfresno.org/tours/nrhp.htm. 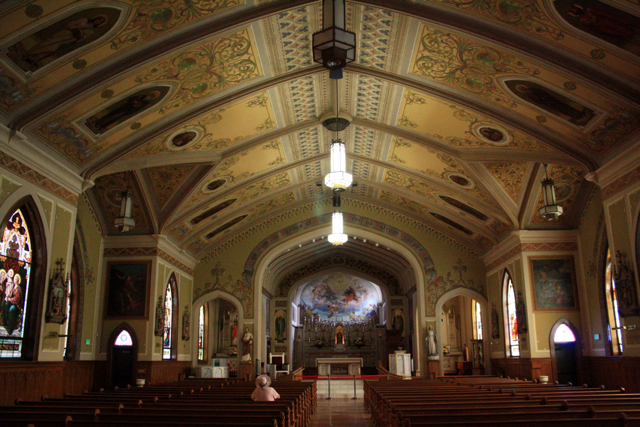 A block northwest of the home at R and Mariposa Streets is Fresno’s St. John’s Cathedral. Dedicated in 1903, the brick cathedral was carefully restored between 1997 and 2002. The structure was seismically retrofitted, a new slate roof was installed, and the artwork and stained glass windows were meticulously restored by an art conservator and restorer who had previously worked on six of the California missions and San Jose’s cathedral. If there isn’t a service in progress, you can take a quiet and respectful look inside the cathedral after you tour the Meux Home Museum. For more information go to http://stjohnsfresno.org/. 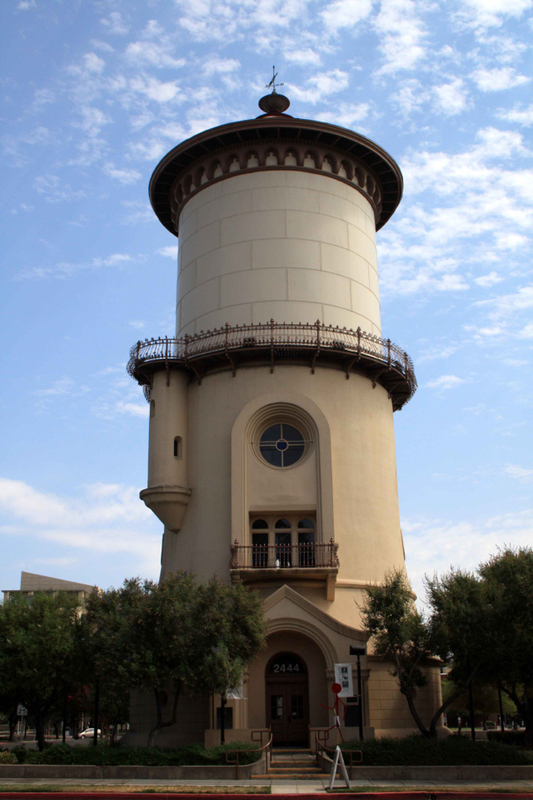 Fresno’s iconic American Romanesque water tower, built in 1894, is also nearby. Located at 2444 Fresno Street, it serves today as a galley for local artists. It is open 10AM-4PM Monday-Saturday, except federal holidays. It offers information about Fresno-area activities and recreation. There’s also an Art Hop reception on the first Thursday of each month from 5 to 8PM. From Antiques Roadshow to American Pickers and Pawn Stars, popular TV shows have long featured treasures found in unlikely places. Just a few miles south of the Merced County line, a new museum displays treasures found in a dump. 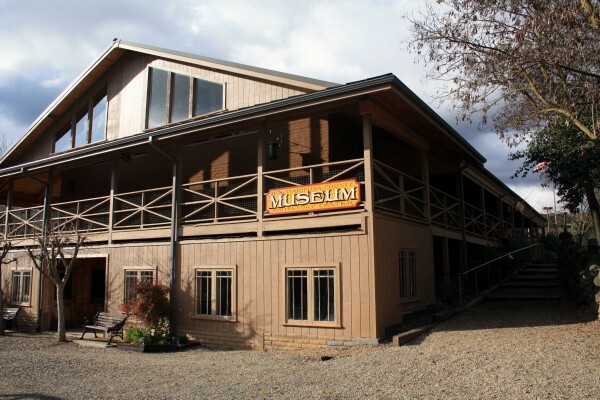 Situated along Highway 99 between Chowchilla and Madera, the small community of Fairmead is now home to the Fossil Discovery Center of Madera County. The excitement started in 1993 when sanitation workers at the Fairmead Landfill discovered part of a mammoth tusk. Experts were called in and the discoveries have continued. Scientists have dated the Farimead fossils to the Middle Pleistocene age – roughly 500,000 to 780,000 years ago. Surprisingly, the fossils were only twelve feet below the surface! Many of the most interesting results of the excavations have been on display since the museum opened last fall. On weekdays visitors can watch fossils being removed from the dirt and examined in the on-site lab. Visitors can learn a lot about the natural history of our region. The Central Valley was underwater during the age of the dinosaurs, so the Fairmead fossils provide a glimpse into a later period when Pleistocene horses, Columbian mammoths, sabre-toothed cats, short-faced bears, dire wolves, camels, and several species of sloths roamed the area that we now call home. Fresno State paleontologists oversee the continuing excavations. Start your visit with the short well-produced video introduction to the museum. It provides a good overview of the site’s significance. You can tour the exhibits on your own but we definitely felt that we learned far more by taking a guided tour. Many displays feature items that can be touched and examined up close. The weight of some of the fossils may be a surprise to some. Many are not completely fossilized and weigh more than might be expected. On some days children can participate in mock fossil digs in an outdoor area adjoining the museum. Call ahead to find out when these mock digs are offered. The Fossil Discover Center is a great outing during the inclement weather of the colder months. To get there, take Highway 99 south to exit 164 (Avenue 21 ½.) Turn left (west) and you will see the Center at the intersection of Avenue 21 ½ and Road 19 ½.
Tours for groups or schools can be arranged. During the mid-1800’s, the majority of people who visited the San Joaquin Valley couldn’t see the agricultural potential that would be unleashed through irrigation. M. Theodore Kearney was one of the few who did and although his name may not be a household one, he played a major role in making the valley what it is today. The most visible legacies of his life are Fresno’s Kearney Mansion and Kearney Park. Kearney started in 1875 by promoting and managing colony development systems in Fresno County. Land was subdivided and sold with irrigation and fencing provided, making grape and fruit growing both possible and affordable for middle class families. In 1883 he began his biggest project – the Fruit Vale Estate. Kearney purchased 6,800 acres west of Fresno with the intention of making it the greatest agricultural colony yet established in the area. Simply raising the investment capital to undertake the massive project – especially the irrigation system – required a three year trip to New York and Europe. Work began as soon as he returned. Kearney selected 240 acres on the southern edge of his property for a park and grand estate that would serve as his headquarters. He commissioned well-known landscape artist Rudolph Ulrich to design “Chateau Fresno Park” in what was then a barren plain. Within a few years the barrenness had been transformed into what was probably the best collection of trees, vines, shrubs, and roses in the United States. In the center of it all, Kearney planned to build a five-story mansion based on the Chateau Chenonceaux in Tours, France. This ambitious plan was the culmination of the remarkable social and economic climb of a man who kept his working-class Irish immigrant background a closely-guarded secret in a time when it was not “respectable” to be Irish. The chateau would be a place where Kearney could proudly entertain his European investors and friends. Kearney’s death in 1906 kept the chateau from being constructed. Kearney had been living in a large home on the property that was ultimately intended to be the Superintendent’s Lodge, a home for the ranch manager. Kearney willed his property to the University of California and the Lodge, now known as the Kearney Mansion, was used by the University until 1962. At that point the Fresno Historical Society began to transform it into a museum. The home has now been a museum for over 50 years. Several restoration projects during that time period have returned it to its original appearance. The others have been matched from old photographs. Constructed in a French Renaissance style out of local materials, the mansion’s two-foot thick outer walls are actually plaster-covered adobe bricks. Hour-long tours of the Kearney Mansion are offered Friday, Saturday, and Sunday at 1, 2, and 3PM. Tour guides are knowledgeable and you will learn a lot about the history and development of our valley during your visit. While in the “mansion” you can see images of what Kearney’s planned chateau would have looked like. If you’re interested in learning more you can pick up a copy of M. Theo Kearney: Prince of Fresno in the gift shop. Eventually the Fresno Historical Society plans to create a larger museum at the site to tell the story of the San Joaquin Valley and its people. Admission to the mansion is $5 for adults, $4 for seniors, students with ID, and youths 13-17, and $3 for children 3-12. Children under 3 are free. Special Christmas tours are offered in December. To get to Kearney Park from Merced County, head south on Highway 99, exiting at Grantland. Follow Grantland south for 7 miles until it ends at Kearney Boulevard. Turn left and watch for the park entrance on the right. The palm and eucalyptus trees around the park were planted by Kearney. They line Kearney Boulevard all the way into downtown Fresno where Kearney ends at Fresno Street. Rehart, Schyler and William K. Patterson. M. Theo Kearney: Prince of Fresno. Fresno: Dumont, 1988.